It seems extraordinary that a month which ends basking in bright blue skies and unexpected warm bright sunshine began in snow and freezing cold with everything muffled in dense white fog. It feels as if spring is early upon us, though from experience its best to temper such expectations. The good spell allows for much maintenance work to be completed in advance of the growing season. All of the window frames around house and the doors to the Temples, Loo and Store have been repainted. The lettering on the wall outside the ‘Loo’ has also been renewed. A new brick base has been made for the Front Garden sundial – ‘poems written upon the breath / poems read between the lines’. It matches up now with the colour and texture of brick used for the Bring Back The Birch. Altogether a more harmonious setting. The greenhouses have been washed out and readied for new seed sowings. More space has been made by placing out the little tree saplings – a nursery area has been made by the storage shed in the Little Wood – the plants can remain here until they are much more mature and ready to fill in or replace future gaps or losses. The main time-consuming task of jet-washing and cleaning of all the stone and brick paths and patio areas has been completed. It is messy but necessary work – but it results in an immediate change in appearance of the backbone structure of the garden. The form and colour of stones and bricks are brought back to almost new – but will soften again slightly before the opening season. Further repairs have been made to some of the more worn and crumbling areas of brick paths. The beehive fishing boat name inscriptions and the signs Morris / Finlay and Reception have now been completed and are ready to be installed back in place. The Claudi bridge has been given some running repairs and repainted – though parts of it are now quite badly worn and crumbling – particularly the top surface and corners, though the lettering on the front face remains clear. The pink cube / form has also been repainted. Those works which have remained uncovered through the winter have also been given a clean – the wooden gate rails – The Fluted Land and Rousseau – Citizen de Geneve; also the carved and painted poems along the stone dyke at the entrance (1942 Two Flowers Together Loosestrife Pink; A drift of Alysse etc. ), along with the ‘WAVE’ landform stones in the Parkland and the PRESENT ORDER boulders on the hillside. The new Friedrich tree column base stone has been completed and installed – remade in Branshaw Yorkshire grey green sandstone – a more hardy durable stone, and much more in proportion to its setting and surroundings. Ever more spring green is apparent – snowdrops continue in abundance, crocuses and daffodils now pushing through – though it will be a while yet before they are fully flowering; there are also cheering little patches of colour from pulmonaria (Adam & Eve plant) flowering pink and blue above their mottled green leaves on the small island in the Temple pond. 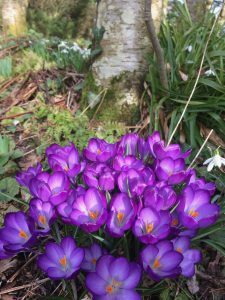 As much promise as all of this holds for the arrival of spring there are signs that we are about to revert back to more normal conditions and a lowering of expectations for a while yet as storms gather for the beginning of March – in like a lion…..